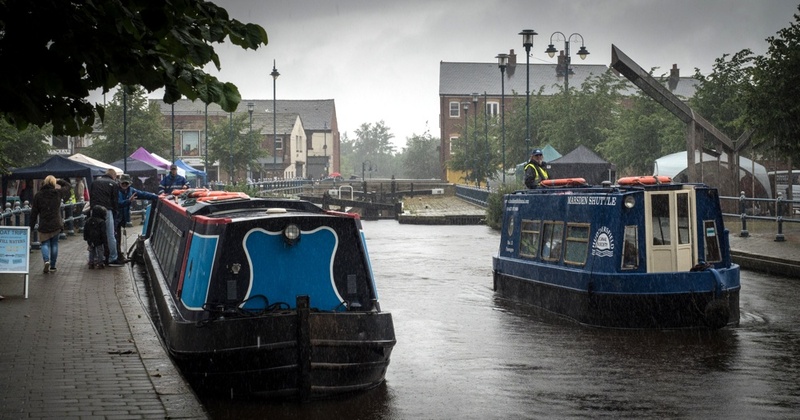 The drizzle got a little heavier around mid-day but despite this it was a better day for weather as 12 boats slipped gently down the 13 locks to Milnsbridge Basin. 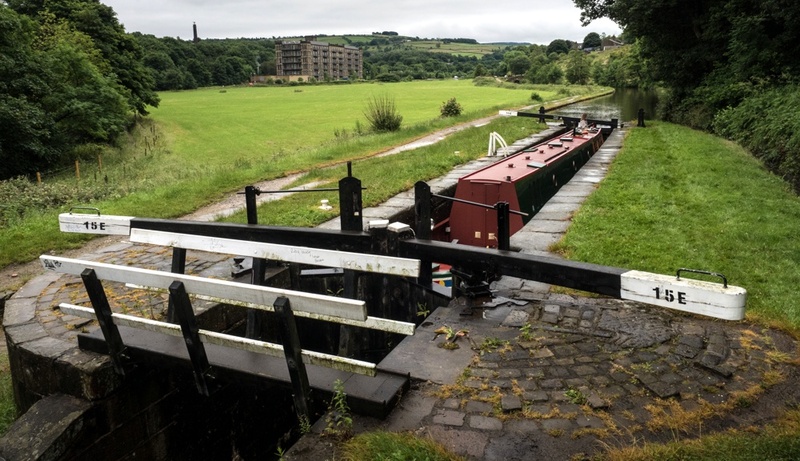 ‘The boat with no name’ which had been shadowing the 12 to Slaithwaite joined the main Pennine Explorer cruise as Troubadour was due to lay over for a few days. Water levels were still high over the weirs which meant that some had to be drained off by CRT when we reached Milnsbridge bringing an extra 12 lockfuls. Thanks are due to Paul and Lesley (HCS boat crew), friend Jean, and Mike and Alan from Calder Navigation Society who put in a good shift helping with locks. Also thanks to Will, Colin and Richard from CRT who kept the water managed through the day. ‘We’ve had far more help than we ever envisaged on this trip’, said Glenys Kershaw of NB Camarilla. Keith Sykes arranged a special evening visit to the Colne Valley Museum at Golcar which involved a short bus journey. 5 volunteers welcomed us, and in showing us around, explained about life in a weaver’s cottage in 1845, and how spinning and weaving was done before the factory era. We were also shown the clog-makers workshop. A pleasant evening was rounded off with tea and biscuits in their well-appointed café. We’re grateful for the enthusiasm of the museum volunteers and the time they made available. 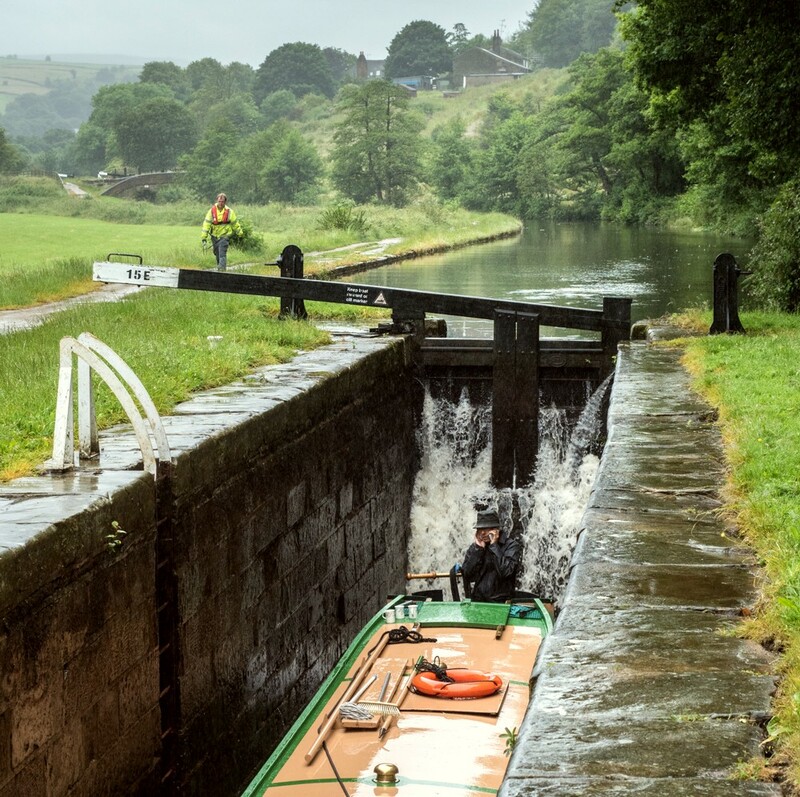 Paul from the Canal Society gets started on Lock 22E with the weather looking none too promising. Pomona’s dog is unimpressed too. 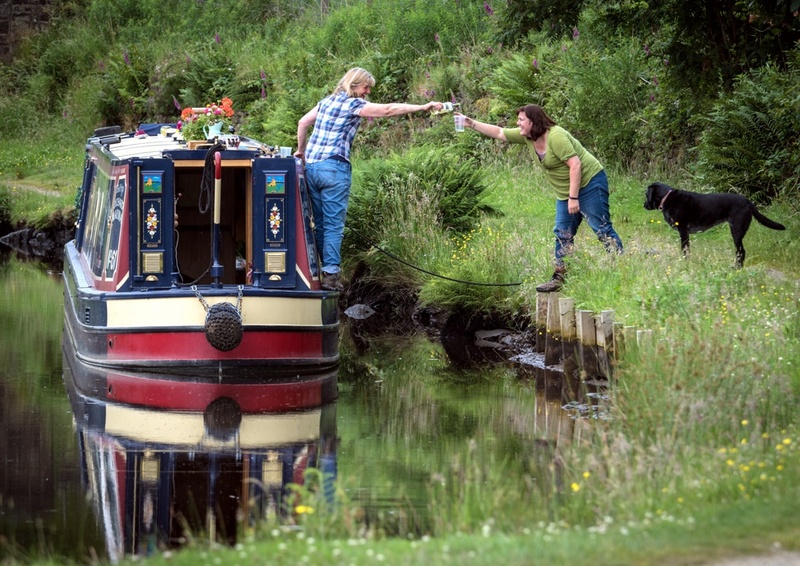 Lock-wheelers Jean (left) and Lesley (right) are ready for anything as they start to work Lock 21E at Slaithwaite. 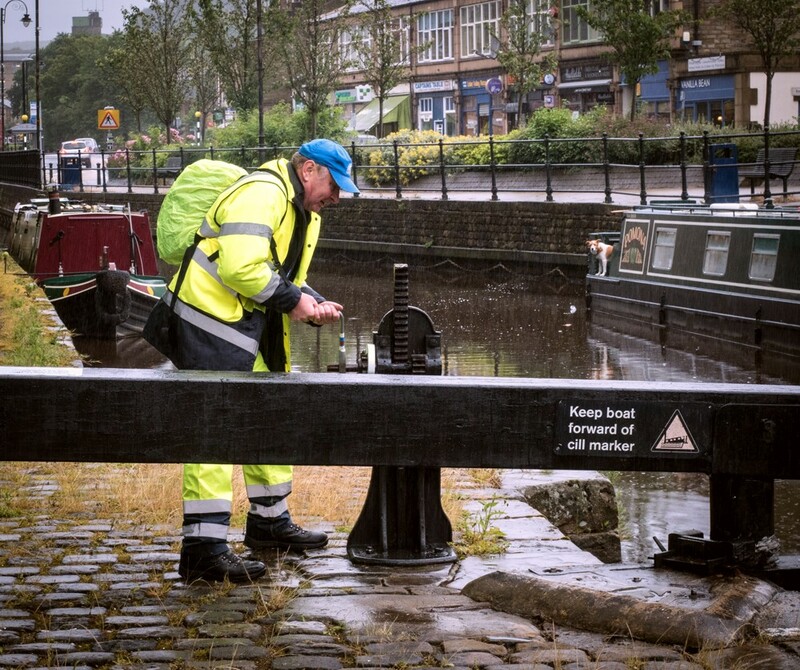 Jack struggles to hear anything on his mobile whilst in Lock 15E at Linthwaite, as CRT’s Will checks on water levels. Bream descends Lock 15E with the magnificent Titanic Mill behind. 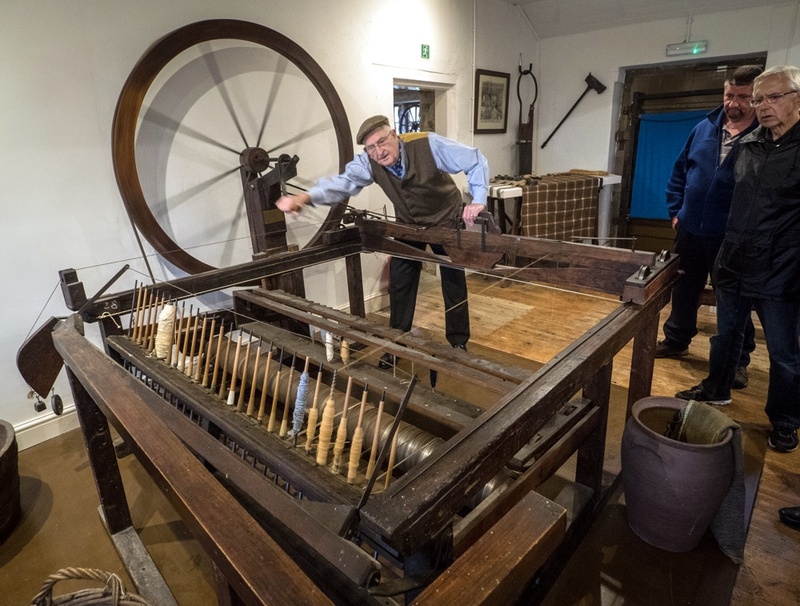 A Colne Valley Museum volunteer shows how a Hargreaves Spinning Jenny works. 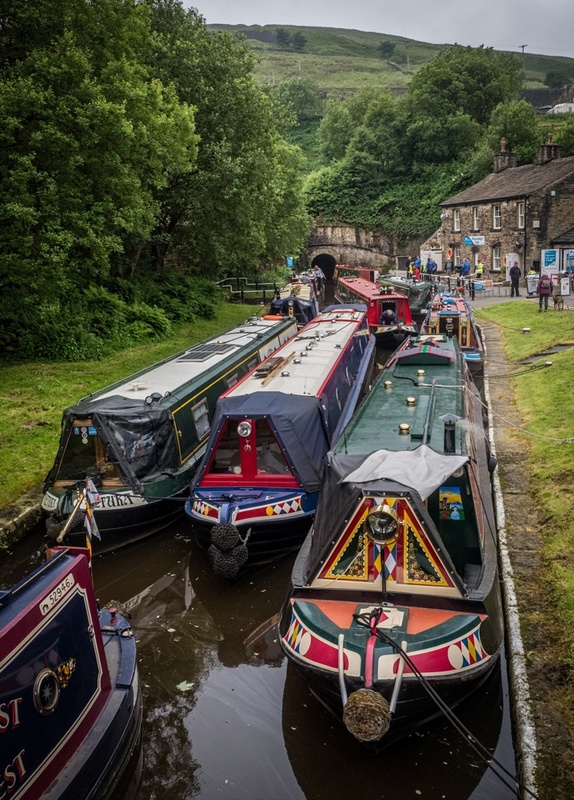 Part of the 12 boat flotilla moored at Milnsbridge. 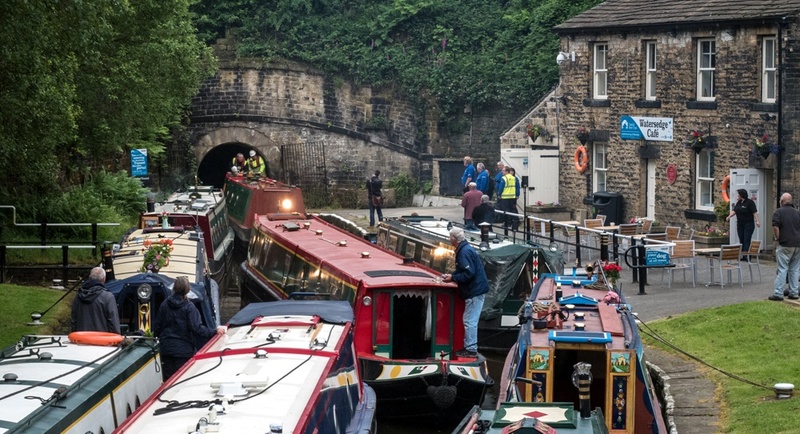 Wall to wall water didn’t stop the 12 boats descending the locks to Slaithwaite today and judging by the evening gathering at the Swan pub it didn’t dampen their spirits. 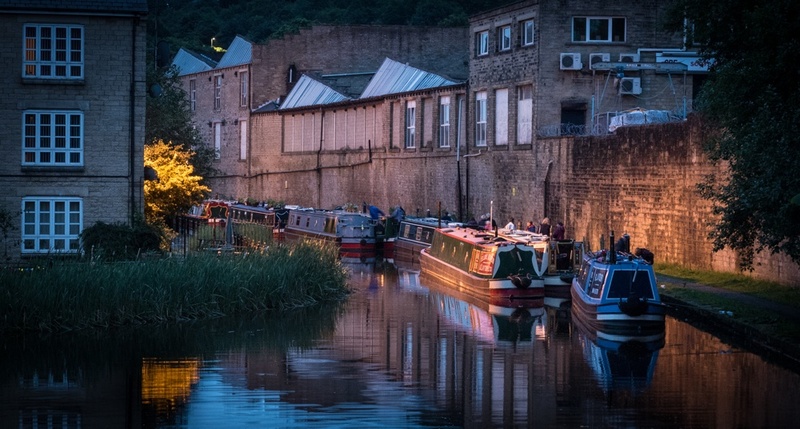 ‘Too much water’ on the Huddersfield Narrow was the surprise verdict as boaters gathered for an evening of song and dance after a day of non-stop rain. 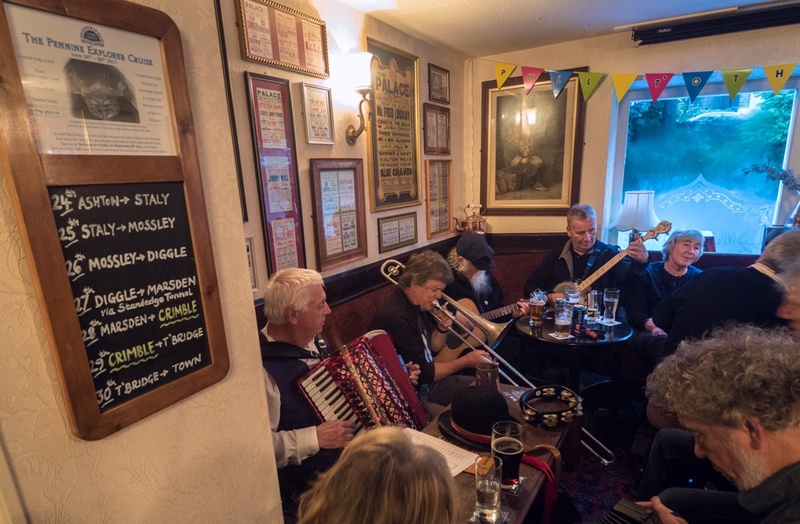 David at the Swan had put out the bunting to welcome us, Thieving Magpies and Slubbing Billy morris sides entertained us outside, and Enoch’s Hammer folk group continued the musical entertainment in the cosy lounge for the rest of the evening. 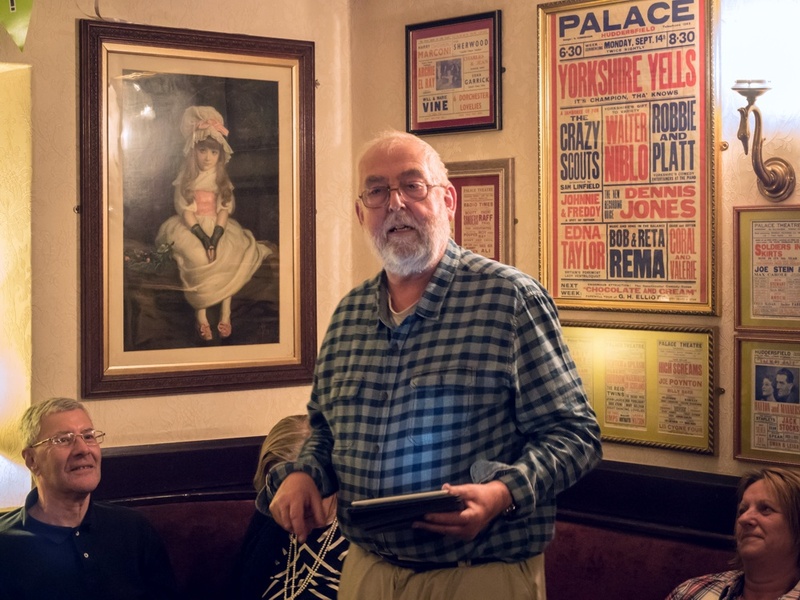 The cruise’s own bard, Ray Butler from Owl recited a number of verses on canal themes, many learnt during his time on the legendary BCN (Birmingham Canal Navigations to the uninitiated) and a good time was had by all. 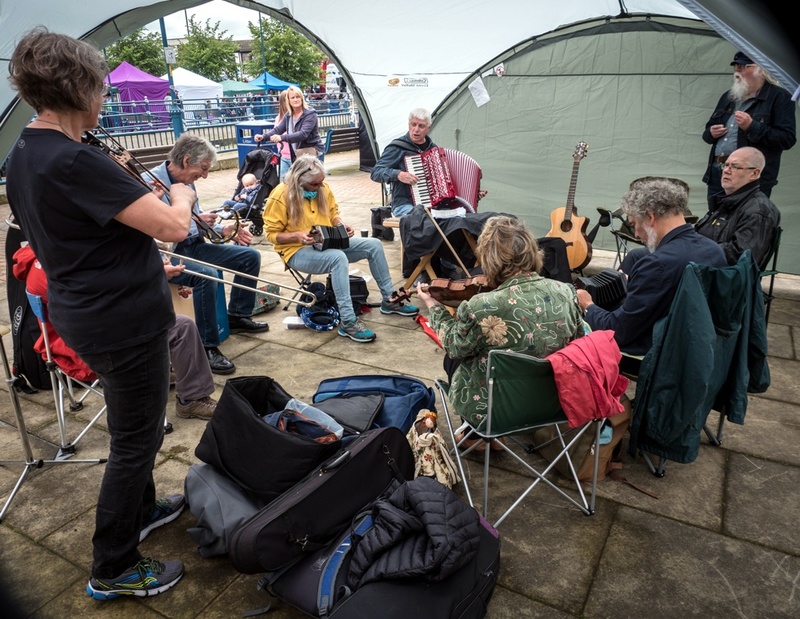 Thanks go to all the musicians and dancers, the landlord and his staff and not to forget, Ali, Peter, Graham, Eric, Jean and Martin who helped on the 21 locks down from the summit. Enoch’s Hammer go through their repertoire – note the PE notice board! 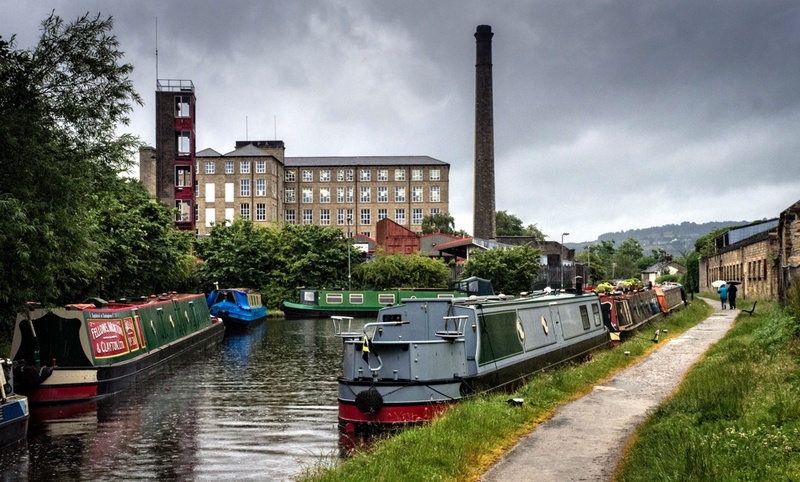 Tomorrow we run down to Milnsbridge…. 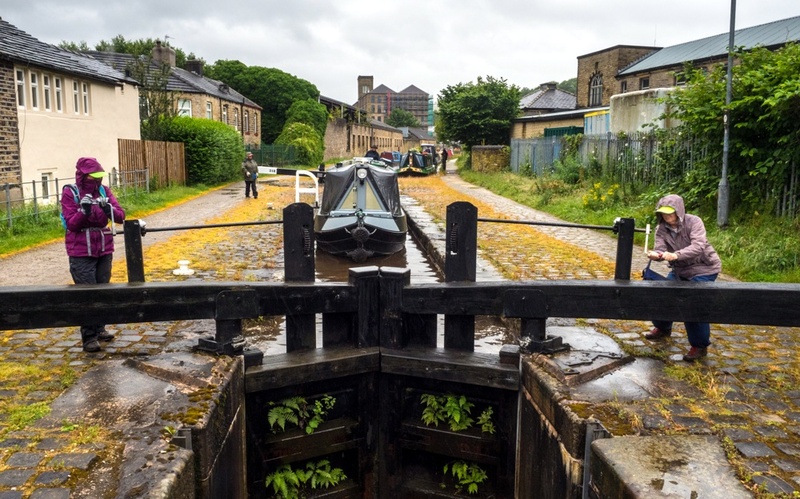 All 12 boats safely made their way through on a record breaking day for the restored Huddersfield Narrow Canal. 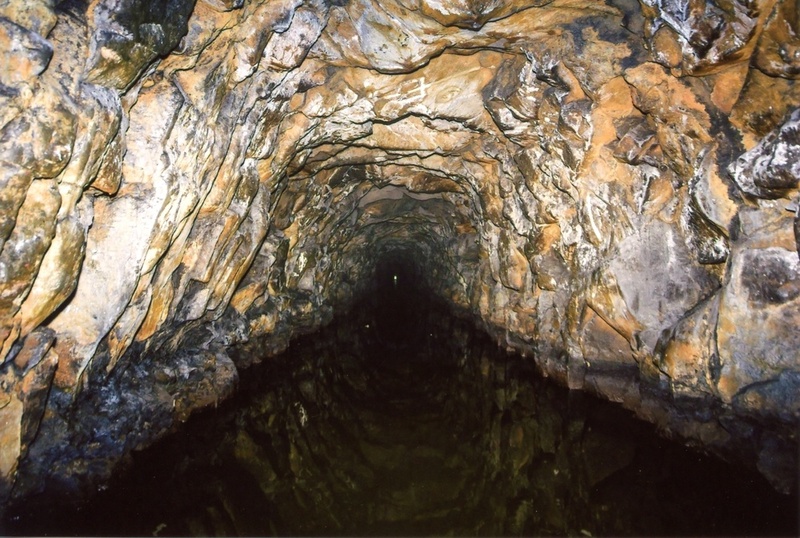 It must be well over a hundred years since so many narrow boats traversed the longest highest and deepest canal tunnel to emerge at Marsden and occupy the basin at the eastern portal. Well done to all the CRT staff and volunteers who helped ensure a safe and informative passage for our intrepid boaters. ‘It’s been a fantastic day’ was the verdict as the crews tucked into barbecued sausages and burgers and a cask of beer from Empire Brewing at the put-up food stall beside Tunnel End Cottages. Particularly appreciated was the help given by the chaperones who guided the steerers through the darkness during the 3 and a quarter mile tunnel passage and pointed out some of the historic features. 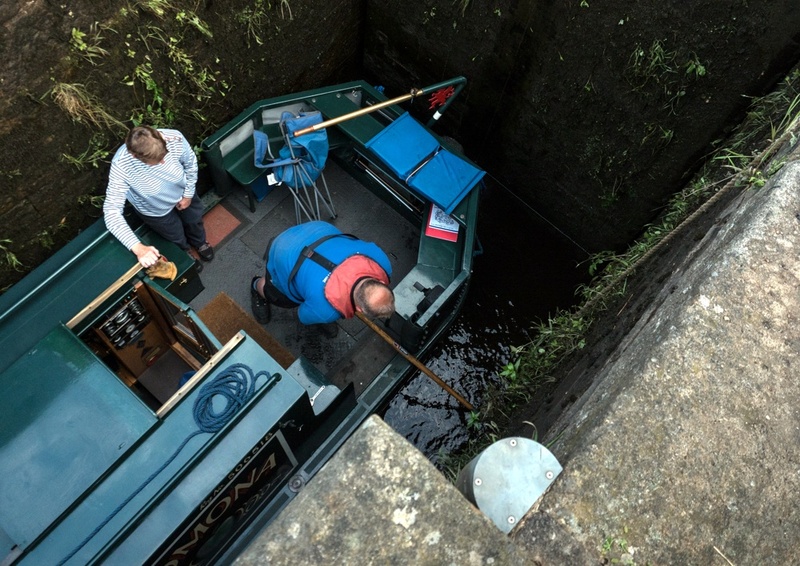 The last boat through emerges a little before 6pm as Steve Wood brings his boat, Bream, through the tunnel portal. 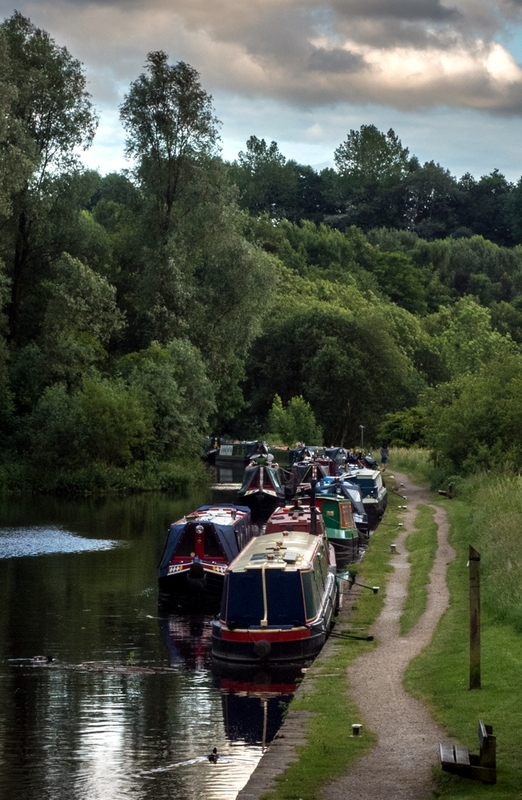 10 of the 12 boats are crammed into the water space in front of Tunnel End Cottages. 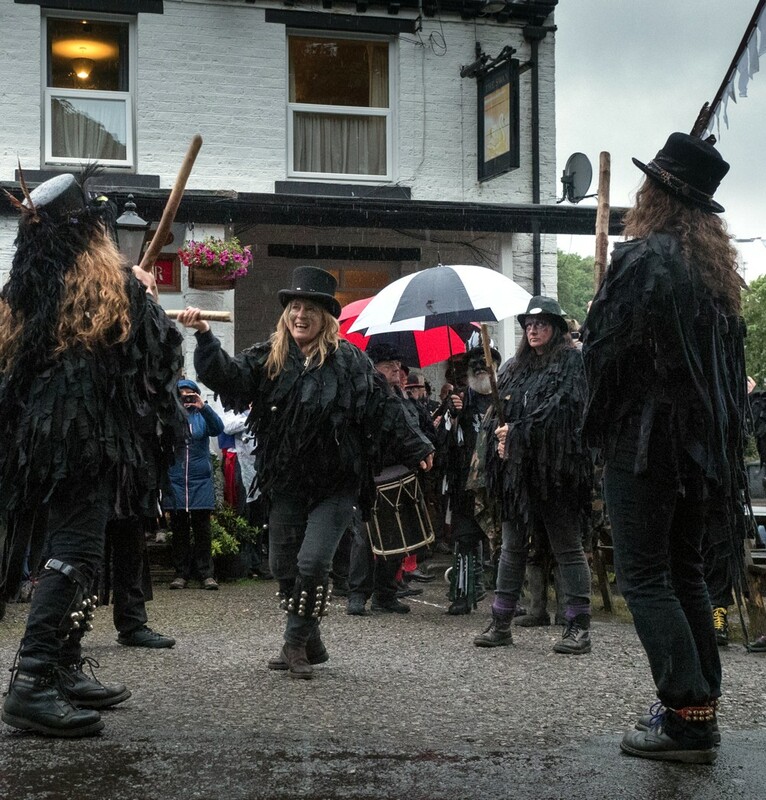 Tomorrow it’s down the Colne Valley to Slaithwaite and an evening of Folk Music and Morris Dancing…..
18 locks, 13 boats and the summit reached by all. 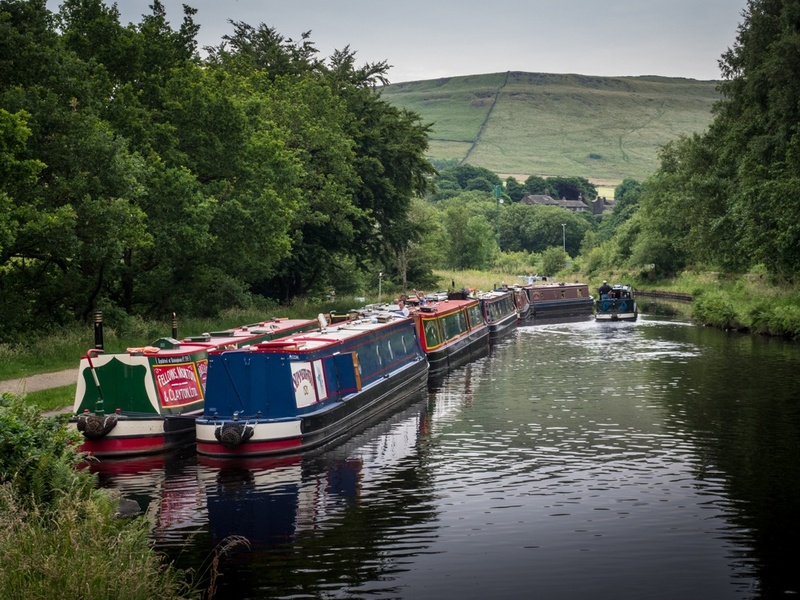 The ‘Everest’ of canal pounds – 645 feet above sea level and the highest in the UK – was reached by the whole Pennine Explorer cruise plus one additional boat after a fascinating if challenging day. 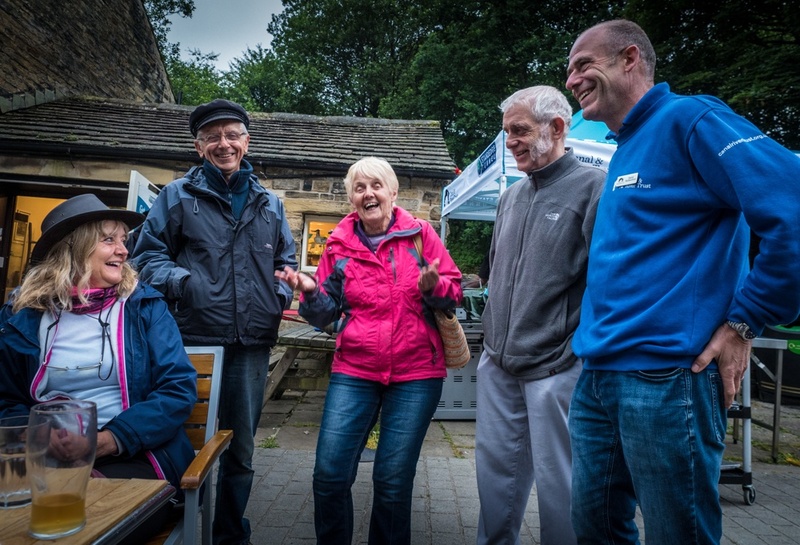 Thanks to friends from Tudor Cruising Club, volunteers from Huddersfield Canal Society and CRT’s own volunteers for all their efforts in helping the Explorer cruise keep on schedule. 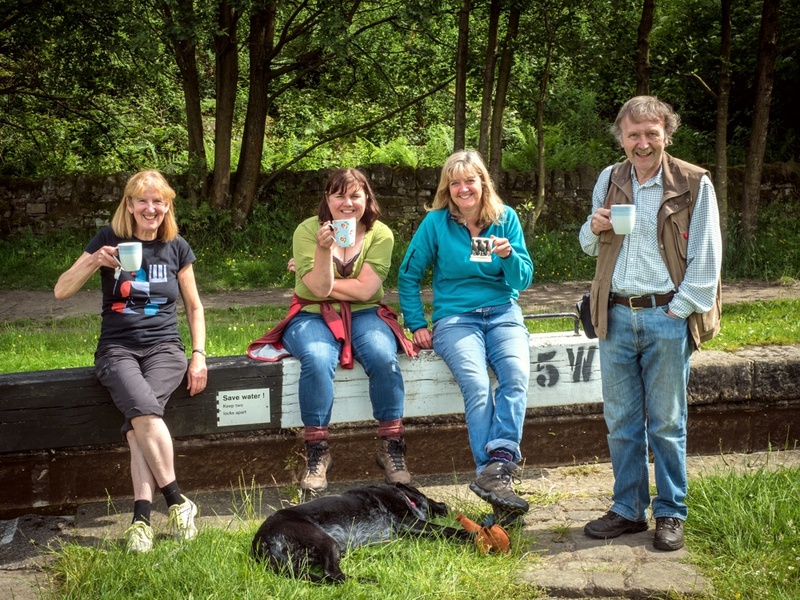 Taking a tea break on the Diggle flight are L-R – Ali from Huddersfield Canal Society, Kim and Nicky from ‘One from the Vine’ and Duncan from Tudor Cruising Club. For a period it looked like the problem at lock 30W would mean mooring on the flight. This did not seem to trouble Nicky, Kim and four-legged friend. Phil Smith applies his magic from the Stern of Pomona whilst Ann looks on. 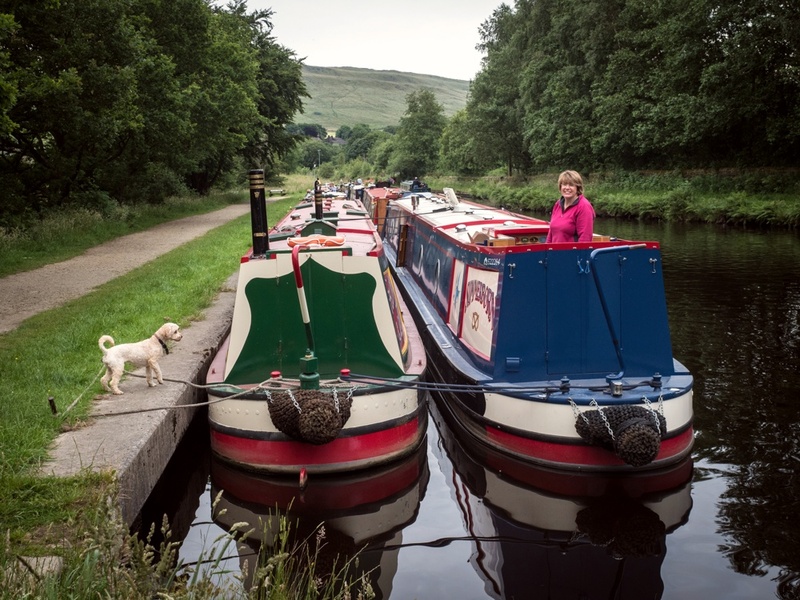 The Pennine Explorer cruise at Diggle Summit with Standedge above. Julie Arnold and friend rest after the climb. 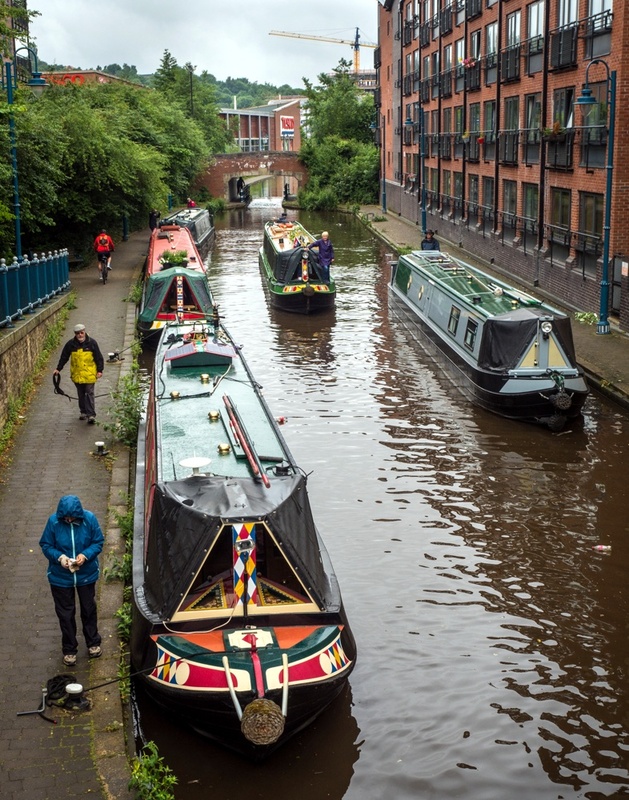 The 12 boat cavalcade left the urban areas behind as it started the climb up the Tame Valley. 8 locks took the boats to Roaches Lock above Mossley and included a passage through the short Scout Tunnel. “I’ve really enjoyed the day and it brings back memories of an earlier trip when I was so struck by the magnificent mill buildings set in the Pennine valleys’” observed Pat Stow of ‘Diligent Too’. 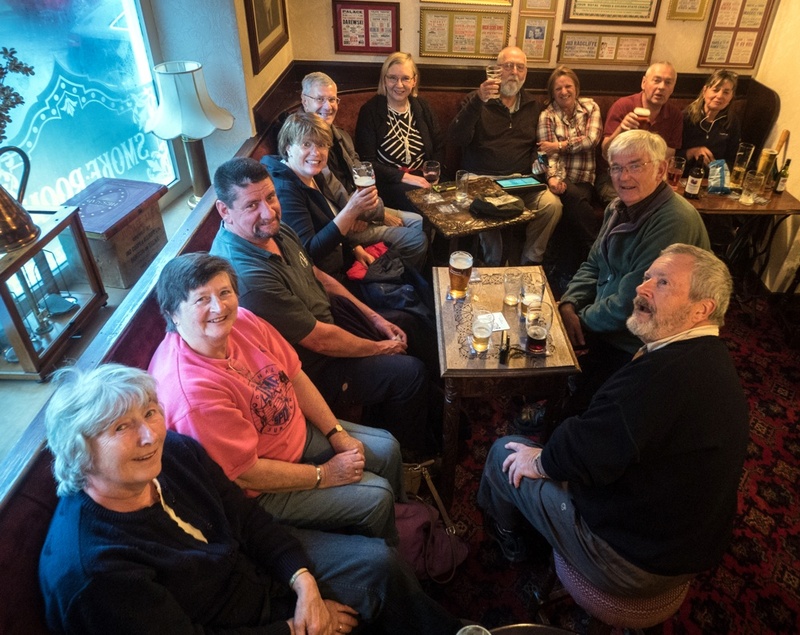 In the comfortable surrounds of the Roaches Lock pub, Alan Stopher, Chairman of the Huddersfield Canal Society, showed the Impossible Dream film made in the run up to reopening of the canal in 2001. The well-made film has stood the test of time and, said Ray Butler of ‘Owl’, “it records the tenacity of those who stuck to their convictions when many doubted that the Huddersfield Narrow could be restored.” Tomorrow (Monday 26th) will see the Explorer cruise reach summit level at Diggle in preparation for the Standedge Tunnel passage the next day. 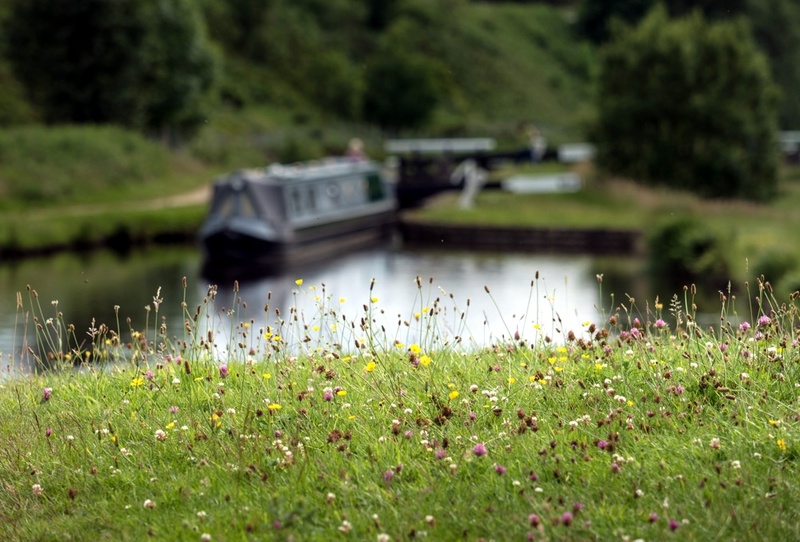 A remarkable 17 boats moored below Roaches Lock. The weather was mixed but the Carnival carried on today. Intrepid Mike McHugh doesn’t let a bit of rain concern him as he takes another Shuttle boat full on a free trip. Passengers line up to join Still Waters for the longer cruise. 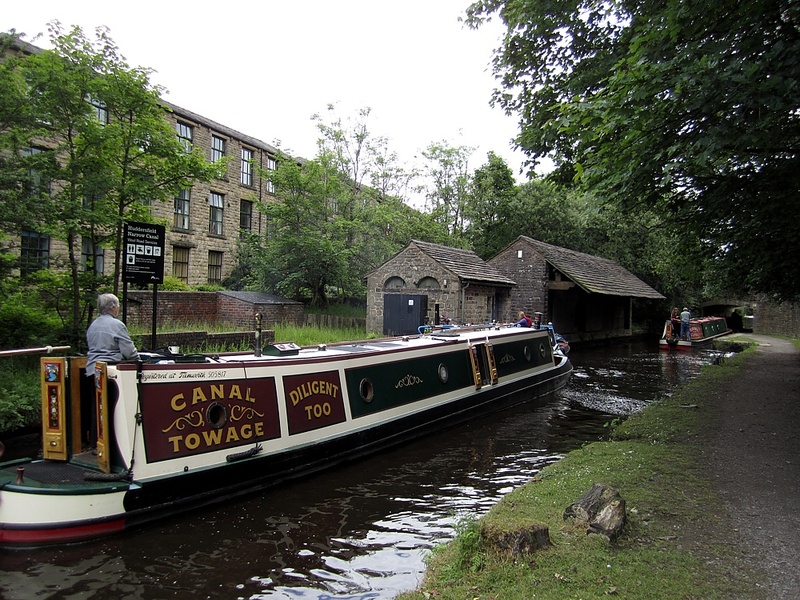 In the evening all the crews headed to the legendary Stalybridge Buffet Bar for pie and black peas and the odd drink. 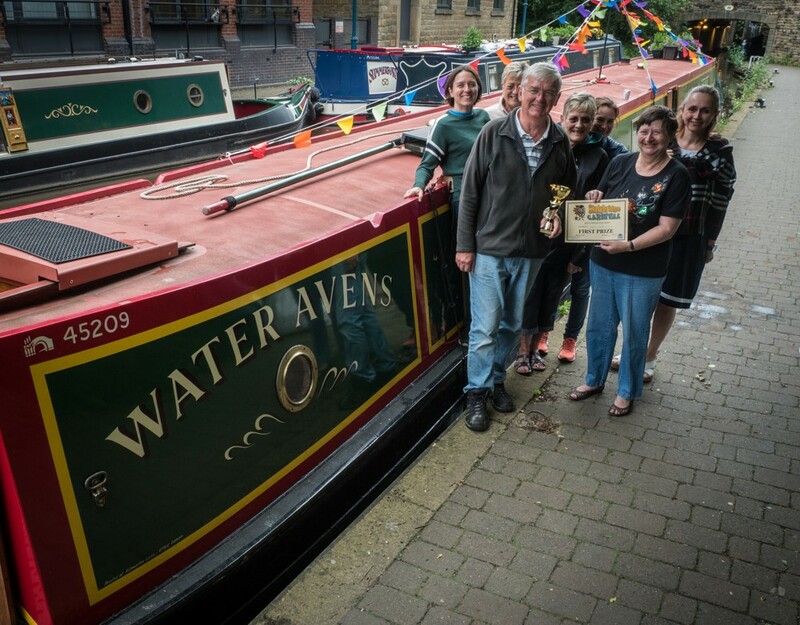 We were joined by friends from the Calder Navigation Society who will be helping out with the locks on the Huddersfield Broad in a week’s time.